The biological sciences currently undergo a scientific revolution, comparable to the revolution in physics in the 1920's. This revolution is characterized by a tremendous increase of information about biological systems, in particular atomic-level structural information and complete genomic information for many species. The challenge for scientists lies in intellectually mastering the available information. Our group focuses on relating the geometrical structure of molecules, proteins, and protein assemblies to their biological functions. In our pursuit, we are guided by the realization that all biological function ultimately relies on the laws of physics properly harnessed by biological assemblies of atoms. 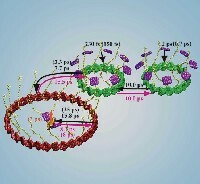 Physical modeling, i.e., applying the laws of physics to determine the static, elastic, energetic, electrostatic, quantum properties of proteins as well as the interactions between proteins furnishes unique insights that complement those gained by comparative or experimental approaches. While we are engaged in formulating theories and conducting computations for biological processes, our measure for success for any given project is whether we can arrive at experimentally verifiable predictions that are acknowledged and tested by biological scientists. Students and postdocs with a good background in physics or computational biology who are interested in a truly interdisciplinary research experience and like challenging research are welcome to join us.